I love quirky books that are hard to categorize. 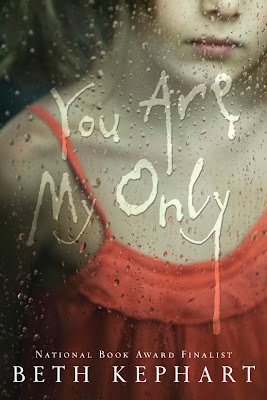 You Are My Only by Beth Kephart is marketed as young adult fiction, but it could just as easily be adult literary fiction. It's a contemporary novel that echoes the language of classic literature. Many lines read like poetry. The alternating chapters follow a young woman and a teenaged girl, each one confined to a miserable existence. The connection between Emmy and Sophie is a mystery for the reader to solve. Sophie is a precocious 14-year-old imprisoned in a series of rental houses. While her mother works as a waitress, Sophie is left home alone to educate herself and not allowed contact with the outside world. Because classic books are her only companions, Sophie sounds like a child from another era. She reminded me of attic-bound Sara in The Little Princess. Quietly rebellious Sophie forms a secret friendship with the cute guy next door and his elderly aunts. This engaging storyline was a delight to read, despite the creepy undertones of the confinement. Emmy married straight out of high school to an abusive man. Her only passion is her baby. After her daughter is kidnapped, Emmy has a nervous breakdown that leads to her institutionalization. Her narrative reads like a wink to One Flew Over the Cuckoo’s Nest and deviates from the central plot. I would have liked to have known more about Emmy and less about her eccentric roommate. Emmy's emotional trauma scrambles her ability to communicate so she remains enigmatic. Don’t you want to keep reading? You don't have long to wait. You Are My Only will be released on October 25, 2011. Disclosure: I received an ARC from the publisher at my request. I’ve gotten to know the author online after interviewing her. You can check out her blog in my sidebar. Un-rushed and hard-to-categorise. Two elements I look out for in the books I buy. I like what you wrote about Beth's poetic style because it also comes across very strongly on her blog, which I have visited on many occasions. Many thanks for such a fantastic review. Has autumn finally arrived in your neck of the woods? Over here, it seems that it will descend on my beloved city this week after a scorching mini-Indian summer. that's some gorgeous prose. how refreshing - and unexpected - to find this in a ya novel. The writing is beautiful, and the book sounds very mysterious and really, enthralling. Thanks for a great review! I've read Beth Kephart before and was not disappointed! Alternating adult and teen voices sounds really interesting. I haven't read a book done in that way before. It would be a good tool to crossover between audiences, if done well, and it sounds like this one has been. I can never get over how much YA fiction has grown up. It's hard to see what makes it YA anymore. I guess having a teenage protagonist. Glad it was a delight to read even with the seriousness of the topic matter. Mostly I tend to stay away from books like this. Too sad sometimes. ACIL, I was introduced to Beth’s poetic writing on her blog too. Her books don’t disappoint. It’s been oddly summery and spring like in Maine for weeks, but we’re supposed to have our first frost tonight. Beth, thanks for this wonderful book and your post! Amanda, YA has expanded into new territories thanks to authors like Beth. Alyssa, good to hear that you’re another fan! Stacy, I haven’t heard of another YA with an alternating adult voice. Emmy is really a new adult herself, fresh out of high school. The blend of teen and adult works well. Publishers have left a gap between teen and adults, and I hope to see more novels bridging that divide. Patti, right you are. YA requires not only a teenaged protagonist, but also a teen point of view. Adult books with teen characters tend to be looking back from an adult perspective. In the end, though, the distinctions are artificial marketing categories. Tina, this book has dark themes but plenty of hope shining through. Lovely writing. Thanks, Sarah--this sounds like a book I'd love. And I am intrigued by the adult and teen alternating viewpoints! What a wonderful review, Sarah! I can't wait to read this book. You make the book sound very intriguing. Not at all typical of YA, it seems. But then, YA isn't at all what it used to be and that's a good thing. It's nice to see a genre re-energized. Sarah, Your writing makes me want to read a book by you as well as the author! I love your analogies to other books and certainly look forward to this one being on the bookshelves in my library and bookstores. Yes, I do want to keep reading Beth's poetic prose. Your writing is so beautiful. Thank you! Beth's style is beautiful, and the story sounds interesting. Now I'm wondering how Sophie and Emmy are connected. I'm still reading a lot, but can't seem to find the time to join in with a book review lately. Your reviews always seem so effortless, yet are so polished! You got me hooked. I love those excerpts and the premise. I'll be looking for this one! I'm intrigued . . .
Can't wait ... Beth's books are always so amazing.